Welcome to the Luminarium Chaucer page. 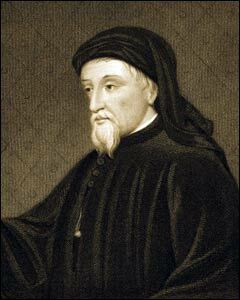 Here you will find a Chaucer Biography, Chaucer's Works, Quotes, Essays and Articles, as well as links to study resources and a list of books helpful for further study. All of these can be accessed from the red navigation bar at the top. The sidebar on the right has links to Medieval writers and works, historical persons and events, and concepts relevant to the study of Chaucer. Many of these links lead to the Luminarium Encyclopedia. And don't forget to visit the Chaucer Discussion Board to chat and ask any questions that may crop up. Site copyright ©1996-2017 Anniina Jokinen. All Rights Reserved. Created by Anniina Jokinen on July 26, 1996. Last updated on June 26, 2017.